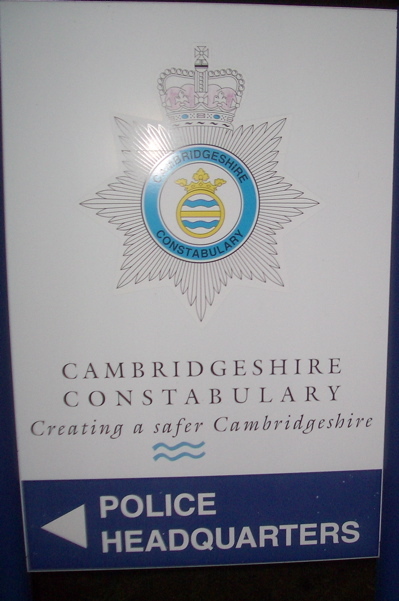 I attended a meeting of the Cambridgeshire Police Authority on Wednesday the 29th of April 2009 . I used the opportunity for members of the public to ask questions to raise the problem of Police Officers stopping people from taking photographs when they have no powers to make such a demand. I would like to draw the authority’s attention to what appears to me to be a systemic problem of police officers and police community support officers telling people to stop filming or taking photographs in public places when they have no grounds, or powers, to make such a demand. I think there is a need to look into why officers think they have powers to stop people filming and taking photographs, and for them to be reminded that generally they do not. This is a particular problem with respect to taking photographs or video of crime and “anti- social behaviour” being committed by, or involving, youths and young people. The police’s first response is not to tackle the problem youths, but to warn the person taking or offering photographs not to take photographs of youths. What has happened to the police to cause them to invoke this kind of response? Are they taking political correctness to an absurd level? Are paedophiles taking photographs of young vandals and moped riders? Are the police no-longer free to exercise common sense? I have asked the Chief Constable about this on BBC Radio Cambridgeshire; she expressed her support for members of the public photographing, and even videoing anti-social behaviour by youths, stating that showing such images to their parents can be a very effective way of putting a stop to the problem. On a related, but separate point I believe it is particularly important that the police don’t try and stop members of the public photographing them on duty / in action when the public think they’re doing something wrong. We note your concern regarding this and ask if there are specific concerns or complaints regarding the actions of Cambridgeshire Officers that these are directed to the Chief Constable so they can be investigated. I used my opportunity to make a brief reply to say that clearly I did not agree with the answer which implies that the subject of my question is considered a matter for the police and not the police authority. Clearly I judged it to be a broad enough strategic systemic problem that it needed to be addressed by the Authority and that’s why I took it to them. Deputy Chief Constable John Feavyour replied to say that there was no police policy allowing officers to prevent people taking photographs and that he would be interested to hear of specific complaints, he said it was a matter for the police’s professional standards department. While Mr Feavyour was saying that to instruct people not to take photos was against police policy I interrupted him say it’s no good having a policy if your PCs and PCSOs are unaware of it. Mr Feavyour looked shocked by the fact I’d interrupted and challenged him; he didn’t answer the point, other than to say complaints would be taken seriously. I have previously taken specific cases to both ward based, and area based police consultative committees in Cambridge and will continue to do so, I think such problems ought be addressed in public forums. Mr Wilkins, a member of the Police Authority, spoke to me after the meeting and we discussed the problem of defining the boundary between a strategic and an operational matter. He said he thought there would be a way for the Police Authority to take action on this – by asking the force to improve their training in this area, and asking them to report back to the authority on what they have done. I drew Mr Wilkins’ attention to the fact this is a national problem, and the fact that dealing with it would I believe be in line with his party, The Liberal Democrats’, national policies. I hope Mr Wilkins, and other members of the Police Authority will take some action on this point in the near future. This entry was tagged Cambridgeshire, Police, Police Authority on May 2, 2009 by Richard Taylor. “Answer given” Er… Richard, you seem to have missed out the actual answer that the police gave. Excellent. Well that’s fine then, isn’t it. It almost makes you want to go out and start taking pictures of police just for the sheer cussedness of it. Well done Richard with this one. What happens on the ground is really the most important thing and people are easily intimidated into thinking they’re doing the wrong thing in taking pictures when clearly it;s hugely helpful. I think that pictures of people openly littering or burning big holes in public space grassland would help stop this kind of thing where people do it because they can get away with it. And how many of us spot people yapping on the mobile phone whilst driving? Do the police want to hear about that. One such absorbed law breaker nearly knocked me off my bike yesterday. I am not from Camebrige but recognise the points made as being endemic throughout the Police service. Although Chief Constables will on occasions issue directives on the application of legislation, when the guidlines are not followed there does not appear to be any re-dress. This situation eventually ends up with unlawful practices becoming accepted. The Guardian have obtained video footage taken by the police at the Kingsnorth power station protest last year. The film shows police officers attack and arrest women for asking for an officer’s number and taking a photo of him. Elements of the UK Police appear to be out of control. I followed this up when I met the Chief Executive of the Police Authority, she claimed it was not a problem which had come to the authority’s attention before. She agreed with Mr Wilkins though on the best approach for the authority to take being to monitor training given to officers in this area. A particularly astounding case of the police stopping a photographer in Kent has been publicised on the photographer’s blog. The photographer was aware of the fact the officers had no power to demand his name and address; but arrested him because they thought him not giving it was suspicious. When challenged by the police officer the man refused to give any personal details which it was thought was suspicious. The Metropolitan Police have updated their guidance on stopping people taking photographs and have made their officers and PCSOs aware of it. I think Cambridgeshire Police need to do something similar. The police appear to have threatened to search him if he did not identify himself. I think the police attitude is awful; we need put a stop to this kind of behaviour by the police as its seriously damaging the relationship between the public and police. If this incident had happened in Cambridge, the photographer would not have been given a Stop and Account form and there may have been no official trace the events took place. We have to get a grip on our increasingly oppressive police. With respect to viewing films and searching phones It’s important that people who’re not criminals, or suspects, ought be able to keep things secret from the state. While full details might not be available on the video it does appear that the police officer lies to the man who has been stopped and tells him he is required to give her his “details”. This appears to me to be an abuse of section 50 of the Police Reform Act which gives police the power to demand the name and address of those they believe are or have been acting antisocially (the relevent definition of ant-social being causing harassment, alarm or distress). No reasons for believing any harassment, alarm or distress had been caused were given, and even if they had been I think this law is far to broad and as seen in this case open to abuse by the police. The acting sergeant appears to claim section two of the Violent Crime Reduction Act requires the photographer to give his name and address. That piece of law relates to the “Duration of drinking banning orders” and is completely irrelevant. I have personally experienced the problem then faced by the individual – the police are saying they can demand your name and address; you are almost completely sure you don’t have to give it, but you don’t have immediate access to the law to check and you know the consequence will be arrest if you don’t comply. Arrest, even if innocent, prevents one from travelling visa-free to the USA and results in DNA being taken (forcibly if necessary) and a permanent entry being made on the national DNA database. I have made an FOI request for information relating to any complaints about the incident and asked for details of any outcomes. Yet another case in today’s paper. A man is threatened with arrest after refusing to hand his phone, on which he’d taken a photo of his son, to a police officer. We must send people to Parliament who will put a stop to this ludicrous policing. There’s an interesting thread containing cases of people being being told to stop filming, and even arrested, by the police for taking photos of them, or simply taking images in public places. My attention was drawn to the thread as it links to this article. I personally feel that the police investigating people under the powers of terrorism is a good thing- perhaps if people were a little more helpful to the police by giving them their details then there wouldnt be all this arresting? Whilst freedom of speech is important there are still laws and boundries within society which should be adhered to. For example if someone (wether authoritarian or not)asks what you are doing- why not just tell them? In regards to taking photographs of offenders then i agree there should be a common sense rule, Ie; If someone is being murdered then the police should (and probably do) have a priority of dealing with the murder not the person stood in a garden next to it filming the event. this rule can also be applied the other way e.g. if a photographer aggresivley uses a camera then that camera should be treated as a weapon. I think you are right to say it would be good if people were more helpful to the police. I think there would be better public-police relations if the police did not exaggerate and mis-represent their powers. The reason the police need to operate with safeguards is because they have the power, in certain circumstances, to demand information and record it, and can also deprive people of their freedom. The police also hold information for inappropriately long periods of time and they are not open enough about what they hold and for how long; this makes people unwilling to communicate with them. A key problem is the lack of full and accurate information generally held by the police; eg. the police may record why they stopped you ie. why they thought your behaviour was suspicious, but not allow you to explain what you were doing and ensure that is also recorded. heard the 1 about the A level student taking photos 4 her school project-PC Plodd dashed out 2 make her delete it-not allowed! So beware all photographers- u may be given an official warning! I’m sure the young lady was impressed by this swift action .. I pointed them to this article and my efforts to draw the problem to the attention of the police authority. I would like to see such a position adopted here in the UK too. I think S76 of the Counter-Terrorism Act 2008 needs amending to prevent outragous threats and arrests of those filming the police. @johnelworthy Hi John, apologies for the confusion, we cannot stop people taking photographs. I took photos of someone who appeared to be breaking into a car in Cambridge and rang the police…….. I was then threatened with arrest fir breaching the person’s human rights, breaching data protection and causing a breach of the peace. The segment also covers the stop and account process and associated data collection (which I think has now been abandoned).